TC Euro Cars Sdn Bhd, the sole franchise holder of Renault cars in Malaysia, last Friday announced that the sporty and stylish new Renault Clio GT Line is now available at all showrooms across the country. Available at the confirmed retail price of RM118,000 on-the-road inclusive of the goods and services tax without insurance for private individual registration, the dashing Clio GT Line comes in four colours: the signature Malta blue, diamond black, glacier white and, for an additional RM5,000, a bold flame red. Presented exclusively as a five-door model but with a sleek coupe-like profile — the rear door handles are cleverly concealed close to the rear quarter lights — the Clio GT Line offers a distinctive look and feel, while delivering solid all-round performance. A fun city car that delivers superior and sharp handling as well as exceptional fuel efficiency, the Clio GT Line is a smart choice for discerning drivers who desire the racy looks of the high-performance Clio RS model, but at more affordable purchase and ownership costs. 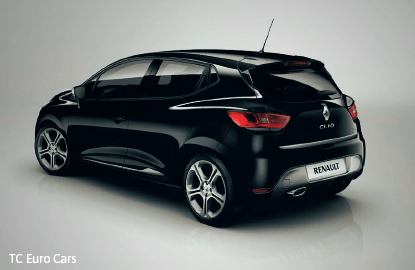 The head-turning Clio GT Line offers a host of bold and innovative features that set it apart from its competitors. The Clio GT Line features the company’s Turbo Control Efficiency or TCe 120 engine — a thoroughly modern power train that comes in a small four-cylinder engine displacement with a turbocharger, delivering performance equivalent to a naturally aspirated 1.8-litre engine. Mated exclusively to the six-speed Efficient Dual Clutch — a technology transfer from the flagship Clio RS — the Clio GT Line delivers a maximum power of 120PS (Pferdestärke — horse-strength in German) and peak torque of 190Nm (newton metre) — enabling powerful acceleration from zero to 100kph in 9.9 seconds. At the same time, this spirited yet fuel-efficient engine also offers fuel efficiency of up to 5.2 litres/100km, equivalent to CO emissions of 120g/km. Additionally, by engaging the car’s eco mode, up to 10% of fuel savings can be achieved. Going the extra mile to improve handling and stability for a more comfortable and enjoyable driving experience, the suspension design of the Clio GT Line was developed to provide driving precision with less noise and vibration. Combined with a longer wheelbase, wider track, more direct steering and an exhaustive weight-saving programme over its predecessor, the Clio GT Line delivers better grip for complete confidence and ease of use, greater precision and good straight-line stability, while being appreciably more manoeuvrable and responsive when cornering. 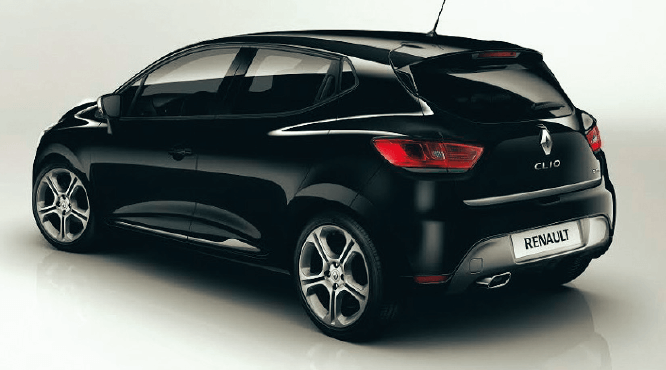 The Clio GT Line’s smooth aerodynamic curves and elegant finishes make a bold statement for any driver looking to stand out in the crowd. Its styling boasts a number of Renault Sport design cues, such as its grille and bold frontal styling, GT design front and rear bumpers, specific rear lip spoiler, wide-set LED daytime running lights, GT Line badging on the tailgate and a chrome finish exhaust tailpiece. Rounding off its purposeful looks are special 17in (43.2cm) alloy wheels, body-coloured side protective mouldings with dark metal insert and dark metal door mirror housing. 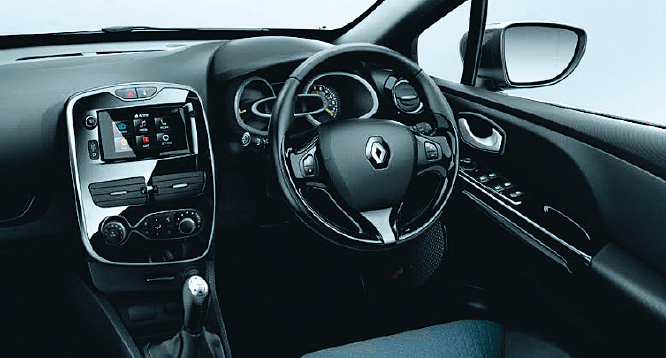 The sports theme continues on the inside with dark carbon upholstery, a grey-trimmed dashboard sculpted in the shape of an aircraft wing, an optimally positioned multimedia system in the centre console and Renault Sport doorsill guards. The Clio GT Line makes the most of its dimensions to offer ample cabin space for front and back occupants, with numerous, well-thought-out stowage points and generous boot space measuring 300 litres, which rises to 1,146 litres when the rear seats are folded — well suited to everyday use and long-distance travel. The Clio GT Line is also packed with a range of useful and convenient features, including a 7in touchscreen MediaNav system with USB and Bluetooth phone pairing, auto headlights and rain sensors, a keyless entry and push-start button with a walk-away lock function, cruise control and speed limiters, motorway mode indicators and the Renault Bass Reflex system, which delivers more powerful bass frequencies and the listening enjoyment of a 30-litre home speaker enclosure. Renault’s long-established commitment to delivering the highest standards of passive and active safety means that the Euro NCAP five-star-rated Clio GT Line comes standard with four airbags (frontal airbags, lateral head and thorax airbags), a pressure sensor to detect impending impacts, anti-whiplash headrests, “submarining” movement prevention in an impact, three-point Isofix child-seat anchorage for three seats (front passenger seat and two outer rear seats) and enhanced pedestrian protection against injury in a collision, particularly to the head, legs and hips. Active safety features include Electronic Stability Control, Roll Movement Intervention, ABS, Emergency Brake Assist and Hill Start Assist as standard equipment. Renault’s unwavering commitment to quality means that the Clio GT Line has gone through hundreds and thousands of kilometres of punishing treatment in Renault’s exhaustive test programme as well as millions of kilometres in real-world conditions on everyday roads. Such tests form part of Renault’s contemporary quality standard procedure to ensure every design aspect — including seat comfort, seals, suspension, noise, vibration and harshness — has the required long-term durability. Likewise, the climate control system has been designed to give optimum performance in extreme temperatures, ranging from -30°C to 55°C, and at humidity levels from 5% to 95%. The MediaNav system, too, has passed through demanding radiation and interference tests. Like all Renault passenger cars in Malaysia, service intervals for the Clio GT Line are 10,000km or six months, whichever comes first. It also comes with a five-year unlimited mileage manufacturer’s warranty which, unlike other new vehicle extended warranties, is fully backed by Renault for enhanced ease of ownership, as there are fewer complications with terms and conditions. “With this launch availability of the new Renault Clio GT Line, we hope this model will increase our base of customers, especially among people who appreciate the Clio model heritage and are looking for a vehicle for their everyday city driving,” said TC Euro Cars Sdn Bhd chief executive officer Kuan Kim Luen. “In addition to the strong value proposition products that we will be launching, we have several key focus areas, which include continued sales growth, quality of service and ensuring that our customers continue to enjoy a very positive experience with our dealer network,” said Kuan. Malaysian drivers who are keen to know more about or test-drive the Clio GT Line are encouraged to call (03) 7956 3103 or visit www.renaultclio.com.my/gtline.